Storm chasers deploy a portable weather station just-in-time. With no time to secure the station's base, they are saved by their vehicle's spare tire before the 100kph winds and driving rain arrive. When one employee at Barani Design, an avid storm chaser, decided to design a portable professional weather station to measure in the eye of a storm, his managers asked "Are you sure that's a good idea? How will you get the weather station into the eye without risking your life? He replied, "Just wait and see" and gave a big smile. The result of his enthusiasm and hard work was a set of 4 professional grade wireless portable weather stations and another big smile when he finished. A few weeks later after his technical feat was complete, the first video documentation of his weather station in action surfaced on youtube. The weather station recorded ground winds in excess of 100 km/hr (60mph) and maximum rain intensity of 46mm/hr (1.9in/hr). After 2 months of in field use, the weathers stations are going strong and making their way into the ever more unpredictable summer storms. 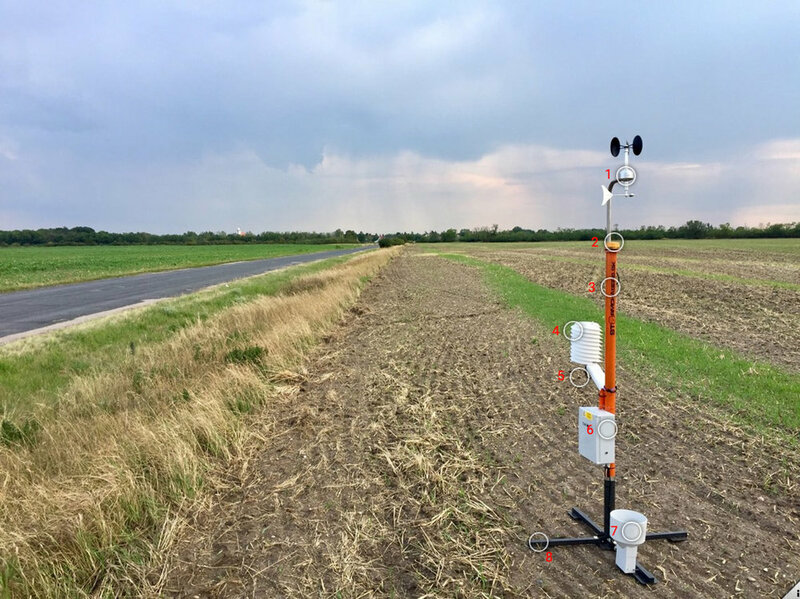 Cooperation with the local meteorological institute started, as storm data from these weather stations has peaked the interest of researchers. Portable professional weather station used for extreme weather storm chasing. Foldable anemometer and rain gauge ensure compactness and quick deploment in the field. Wind speed and direction sensor - MeteoWind professional anemometer with a wind vane on a foldable stainless steel arm. Signalization Light - orange flashing light used to identify the location of the weather station during night deployments. Steel Frame - robust steel tube frame for weight and stability in high winds. Painted orange for daylight visibility. Radiation shield for sensors - in this application MeteoShield protects the temperature, humidity & pressure sensors not from the sun, but from driving rain, hail, splashing water, flying dust & dirt and other debris found flying in storms. Temperature, Pressure & Humidity sensor - a combined MeteoTemp sensor with professional grade temperature accuracy. Wireless data logger - professional EasyLogGSM data logger with internal SD card memory to keep data secure and retrievable if wireless transmission fails in a storm. 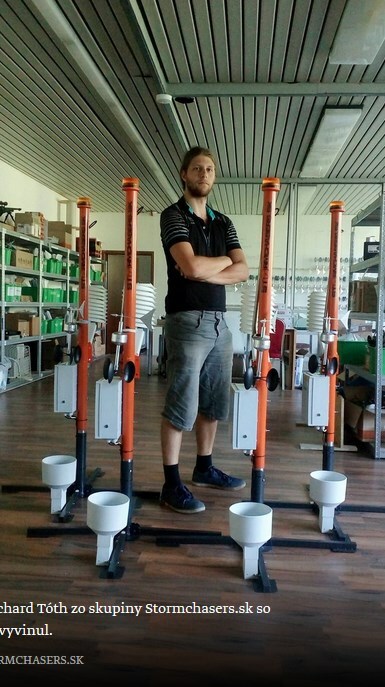 Professional Rain Gauge - a foldable standard 200cm2 professional rain gauge for recording rain fall and intensity. Foldable metal stand - a quickly deployable metal stand with four feet for easy storage in a car and quick deployment in the field. Getting in the right position in front of a storm is crucial for measurements. As a reward for for a risky night chase, an unbelievable night time rainbow fromed just under the stars. 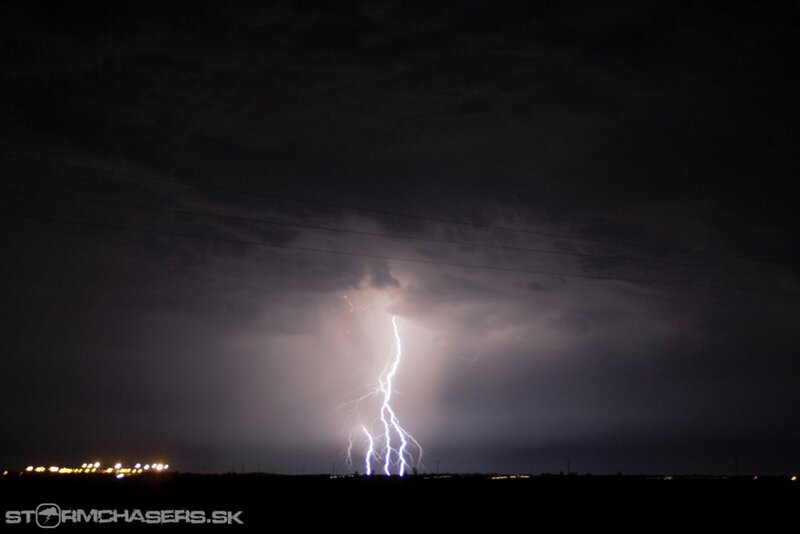 The CG (cloud-to-ground) lightning strike resembling Poseidon's trident. The gods were angry this night and it showed. NOTE: Cloud to ground lightning strikes actually start from the ground. Return lightning strokes form the trident in this picture. Outsmart your competition with allMETEO Smart-City sensors. allMETEO is the USA official distributor of the BARANI sensors, whose roots are in upstate NY. We provide sales, service and support for meteorological instrumentation for the Americas. Your source for meteorological sensors and complete wireless measurement systems. We provide sensors, loggers & AWS electronics for use in automatic weather stations (AWS & AWOS) in Meteorology, Climatology, Wind resource assessment, Aviation systems, Road weather stations, Coastal and Marine applications, Offshore and Industrial systems. Measure with the best. Reach your gold standards of measurement with allMETEO. Improve your measurements. Save your budget. allMETEO is a distributor of BARANI DESIGN brand of meteorological sensors.